Thank you to everyone who came out to our 4th Annual Kick Off Dinner & Raffle May 7. Once again it was a packed house and it was great to see so many new faces! Our raffle table was a huge hit with over 50 prizes to be won! Thank you so much to all our generous donors who helped make this all possible! 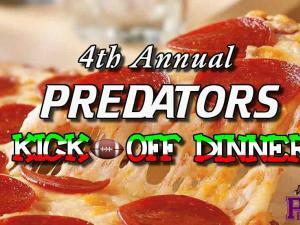 With all your support we managed to raise just over $4000 for our Predators teams!! Woot Woot!! One of our favourite part of the night was seeing all our players from SV to Peewee outside doing what they LOVE - playing football together! Football, friends, family and food! Doesn't get any better! Our Raffle Room filled with great prizes! Thank you to Riddell for donating a helmet that the winner can customize to their NFL/CFL team of choice! Thanks Coach Frank and Coach Darren for being our friendly pizza guys! Thank You to our Team Managers and Kick Off Dinner committee for organizing this event and ensuring everything ran smoothly. You ladies are amazing!